Badly made, generally unpleasant thriller that's let down by a patchy script, dodgy dialogue, some pretty serious miscasting and a risible final act. Directed by Rob Cohen, Alex Cross is based on the novels by James Patterson and stars Tyler Perry as Alex Cross, the detective played by Morgan Freeman in 1997's Kiss the Girls and 2001's Along Came A Spider. Set in Detroit, the film sees Cross and his police detective team (Edward Burns as Tommy, Rachel Nichols as Monica) on the trail of a sadistic killer known as Picasso (Matthew Fox) as he murders his way up the chain of a multi-billion dollar conglomerate headed by Frenchman Leon Mercier (Jean Reno). Meanwhile, Cross has various other issues on his hands, such as the fact that the FBI have offered him a job and that his wife (Carmen Ejogo) has just announced that she's expecting their third child. However, when Picasso discovers that Cross and co are on his trail, he interrupts his killing schedule and targets the police instead. The film's biggest problem is the huge double dose of miscasting at its centre. 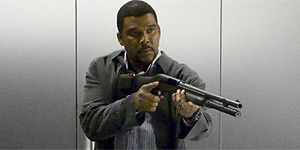 Tyler Perry (making his first foray into other people's films after his own career as the writer-director-star of tame family fare) is comfortable enough being the cuddly family man early on (as per his usual screen persona) but he's a lot less convincing as a super-sharp detective, let alone a revenge-driven, shotgun-loving action man. Similarly, Matthew Fox (who apparently lost a lot of weight for the role, not that the film deserved it) is equally badly cast as the killer, since he's never scary or believable enough to generate the required tension. The script is both lazy and ridiculously simplistic; as an example, it's the sort of thriller that asks you to believe a newspaper would carry huge photos of three detectives on a case on its front page. In addition, the dialogue is frequently dodgy (Cross losing it on the phone is a particular lowlight), all the characters behave completely inconsistently from scene to scene and the film as a whole has a generally unpleasant vibe to it, from its obsession with (largely offscreen) torture to its appalling attitude towards its female characters; Rachel Nichols' Monica receives particularly short shrift, for example, despite being the most interesting character on screen. To be fair, the first half of the film is just about watchable in a trashy sort of way, but it's elbowed into one star territory by a risible, nonsensical final act that includes a poorly conceived, ludicrously implausible car crash scene, a badly directed climactic fight sequence (the sort where you can't tell who's hitting who) and a final twist that's laugh-out-loud stupid and makes an even bigger nonsense of all the nonsense that's gone before. Alex Cross is a poorly made, unsatisfying thriller that gets progressively worse as it goes on. Avoid.